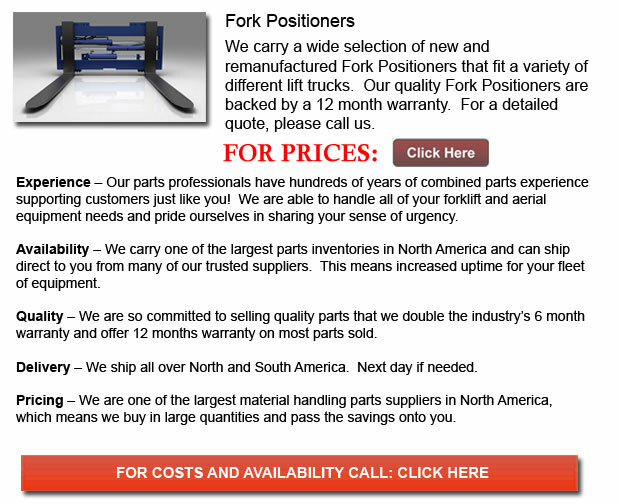 Fork Positioner for Forklifts - A fork positioner is a device made out of high quality materials designed to be able to endure the most demanding operations and work environments. This piece of equipment enables the individual driving to be able to operate the forks hydraulically without leaving the seat. Side shifting models have the extra ability to be able to laterally position the entire load or the arms in order to facilitate more exact carrying and placement in a quicker and more efficient method. The only one of its kind fork pocket design enables the one operating it to be able to safely swing the unit's blades without any worry of destroying the positioning cylinders. This could allow the worker the choice to either perform independent or simultaneous blade movement, dependent upon the requirements of the job. For most forklifts with non-OEM carriages, complete carriages are needed. Standard OEM carriages can be transformed into blade positioners on existing units.